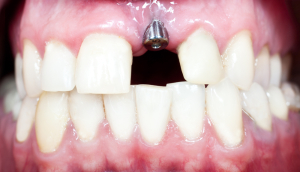 Though there are many effective treatments that will replace lost teeth, many dentists will generally recommend dental implants as one of your best options. This is because losing the roots of your teeth can impact your oral health. Roots anchor your tooth to the jaw, and your body sends nutrients to the jawbone for it and your tooth. Without the roots in this area, your body will not send these valuable nutrients, which can cause your jaw bone to deteriorate. Dental implants, however, can replace these missing roots. Implants are posts that are inserted into your jaw. With the post in place, your body should continue to deliver nutrients to that area to stop your jawbone from eroding. This erosion could lead to more lost teeth, so dentists tend to prefer the method that keeps the flow of nutrients intact. Implants are also secure, durable, and look natural when topped with another dental restoration to form the crown of your tooth. 1.) The first step is to determine for sure that implants are the best option for you. For instance, an implant requires that your jawbone be thick enough to receive the post and you must have healthy gums. 2.) If we decide to move forward with implants, we will then refer you to an oral surgeon or periodontist who can insert the post. 3.) They will apply a local anesthetic to minimize your discomfort during the procedure and wait for it to take effect. 4.) They will then plant the post or posts in your jaw. This post should begin to integrate with your bone after a certain time, thanks to the biocompatible titanium they are generally made of. 5.) It will take about 2-4 months for the gum to heal fully, when we can proceed to the next stage of treatment. Once the implant has been successfully planted, we can top it with an abutment and then whichever restoration will work best for your needs, such as a crown, bridge, or a denture.